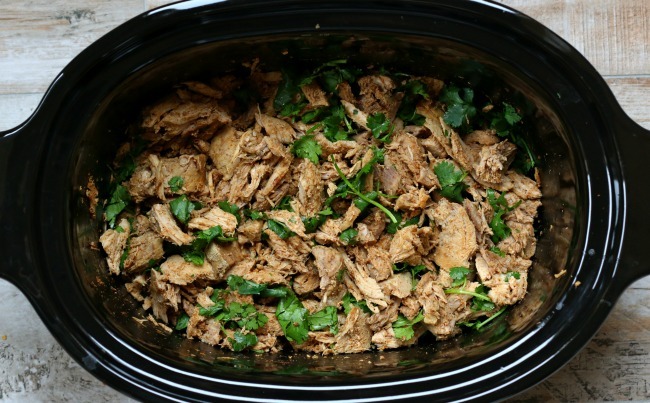 Slow Cooker Cilantro Lime Shredded Pork: A zesty, versatile shredded pork that can be served in salads, tacos, burritos, quesadillas or enchiladas. 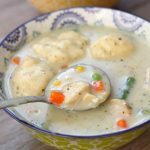 This is a perfect kid-friendly summer slow cooker meal that can also be easily made into a freezer meal. All I want to eat in the summer is ice cream and popsicles. All I want to make for dinner in the summer is nothing. For some reason I just can’t get excited about cooking in the summer. Luckily, the slow cooker does help. If I can get something made by 10 or 11 am then I’m so proud of myself and feel like I’ve accomplished a lot. I’ve been posting 100 days of slow cooker summer ideas on my instagram and I’ve compiled all 100 days in an ebook that you can find by clicking here (I show you the entire table of contents plus a preview of what it looks like inside). It may just help you get through the summer. Today I want to share a new recipe that is super simple and very versatile. I like to serve this pork in all Mexican dishes. It is amazing wrapped up in enchiladas or a taco shell. If I’m eating a little lighter I’ll serve the pork on top of salad greens with tomatillo ranch dressing. The pork that I used is very lean and I buy it at Costco or Smith’s for close to $1.60 a pound. Score! Because it’s so lean I like to flip the meat halfway through the cooking time so that both sides sit in the juices. But if you aren’t home, I wouldn’t worry about it too much. It will still taste great. If you want to make this meal a little creamier you can always serve the pork with a dollop of healthy Greek yogurt or less healthy (but better tasting?) sour cream. I like to make my yummiest ever slow cooker black beans with my Mexican meals. I also love serving this cilantro lime pork with avocado slices. 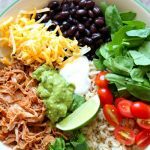 A zesty, versatile shredded pork that can be served in salads, tacos, burritos, quesadillas or enchiladas. 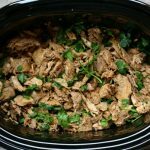 This is a perfect kid-friendly summer slow cooker meal that can also be easily made into a freezer meal. Place pork in bottom of slow cooker. Top with lime juice, chili powder, cumin and kosher salt. Cover and cook on low for 6-8 hours. If you are available, turn the meat over halfway through. 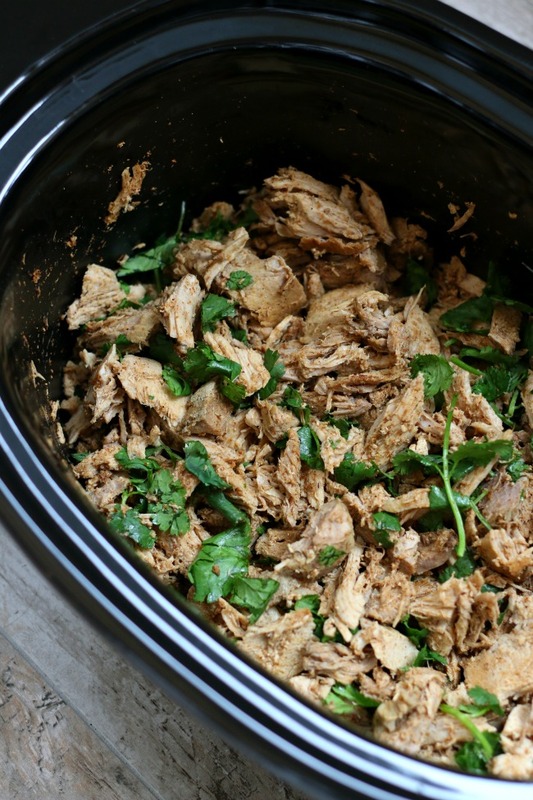 Remove the pork from the slow cooker and place on a cutting board and shred. Let it rest for 10 minutes. Add the pork back into the slow cooker and stir. Add in chopped cilantro. Serve pork in tacos, burritos, salads, quesadillas, enchiladas etc. To make into a freezer meal: combine all ingredients in a gallon size zipper bag. Freeze. When ready to cook remove from freezer and thaw in the fridge overnight. Cook on low for 8 hours. Is there enough liquid in this recipe? Can I add water or stock to ensure it’s moist enough? You could add in a cup of broth. If I double the size of the roast, doubling the seasonings won’t be too much will it?? nah, it will be perfect. 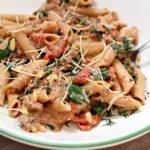 This turned out positively divine – and so easy! Thank you! This was very easy and good. I love lime and cilantro! I’m new to slow cooking…if a recipe says to cook on low 6-8 hrs, can I cook it on high 3-4 hrs instead? Yes Sharon you totally can! Most of the time if I can I try to use the low setting but when I’m late on getting things into the crockpot I crank it up to high and it works great. Your print icons are not working. I opened safari and was able to print that way. 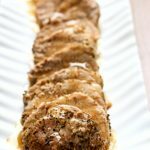 I really loved this recipe! 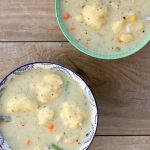 Will definitely be making it again – so easy, so few ingredients and yet so good. One glitch: I tried to print this for a friend. It keeps getting stuck before I can print it. I’ve tried both Print icons on your page. Neither one works for me. Hmmm, really? I’ll have to look into it. Thanks for letting me know! Could I use chicken instead? It’s what i have today. Lol. yes it will work great! cook on low 4-6 hours! 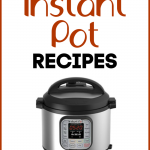 I love letting my slow cooker do the cooking, especially in the summer, and this sounds like a great recipe to add to my collection. I may have missed reading something above, but where is the cilantro? Do you add it after the pork has cooked and you are ready to serve? It looks very yummy and I love cilantro! Thanks for catching that Tammy! I missed putting it in the recipe. It’s corrected now.